Getting up early can make you more productive, focused and motivated. Wake up early in the morning will give you plenty of time to complete all of your daily tasks. Here are seven ways to start your morning fresh and better. Get up correctly from the bed. There are many ways to get out of bed. The best way is: Roll over onto your right side, then gradually push yourself up into a sitting position. It’s the gentlest way to get up, takes the pressure off your heart and back, and is a great, easy ritual to start your morning right. Start your day with a positive mindset and make it a habit of doing so. Give yourself a few minutes of “quiet time”. Listen to your inner voice. Allow the positive energy in as soon as you wake up. Read: How to Think Positive and Banish Negativity? Reward yourself for getting up early. You deserve it! We all need little rewards in our lives to keep us motivated. You can see a beautiful nature or give yourself a beautiful flower. You can give yourself an humble herbal tea. Think about the things you love to do that make you happy. Just visualizing doing something that makes you happy is bound to make you actually feel happier in return. You can go for a nice morning run, before the weather gets too hot. Drink eight ounces of water. You’ve been fasting all night and you wake each morning dehydrated. Dehydration can drain your energy and make you tired. To stay well hydrated, you should drink 2.2 to 3 liters of fluid per day. Drinking about half a liter (about two glasses) of water in the morning. Open the windows when you wake up. Sun exposure helps the body produce vitamin D, which is important for good health. It also boosts serotonin levels, which can improve mood and help you sleep better in night. You can do ten minutes simple yoga stretching exercises. That will feel you stronger, flexible and more relaxed in the morning. You can do this in bed, using a simple stretched-out-legs-and-arms-overhead movement. You can indulge in a supine twist on a padded floor, or you can practice whatever feels right for as little or as long as you like. Your body’s just been booted down for hours–you can’t expect it to be warmed up, energized, and raring to go right away. 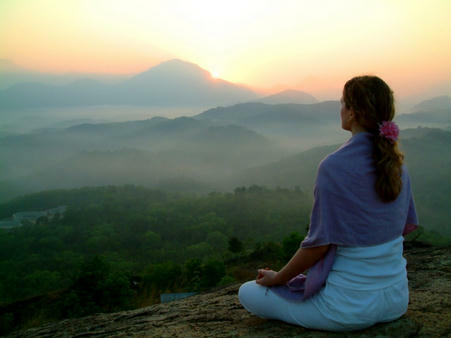 Morning meditation will help you to be more productive, focused and motivated. After a night of rest your mind is clear, and research shows that willpower is greatest in the hours after waking. Sit quietly for few minutes, either cross-legged on the floor or on a chair. Be sure that your spine is straight but supple. Now, simply notice your breathing as you inhale and exhale. It is through following our breathing through our sensation that we begin to open to the power of breath. During inhalation, sense the temperature and vibration of the air as it moves from the tip of your nose through your nasal passages, throat, and trachea on its way into your lungs. During exhalation, sense the air going up and out of your lungs through your trachea, throat, and nose. After about five minutes, rub your hands together for several times. This stimulates the flow of prana and produces heat. This is to magnify the healing power of your hands. Close the eyes and place the warm palms gently over your eyes. Then put them over your ears and then put them over your navel. You can put your healing hands throughout your body and give blessings to your body parts. Feel the sensations at each of those places. This entry was posted in Articles, Conscious Living, Happiness, Health, How to Meditate, Meditation, Well-Being, Yoga, Yoga Life Style and tagged herbal tea, morning meditation, Simple Yoga Stretching. Bookmark the permalink.